Once in a while, a book comes along that changes how you think, feel, and act every day. In Eat Move Sleep, #1 New York Times bestselling author Tom Rath delivers a book that will improve your health for years to come. While Tom's bestsellers on strengths and well-being have already inspired more than 5 million people in the last decade, Eat Move Sleep reveals his greatest passion and expertise. Quietly managing a serious illness for more than 20 years, Tom has assembled a wide range of information on the impact of eating, moving, and sleeping. Written in his classic conversational style, Eat Move Sleep features the most proven and practical ideas from his research. This remarkably quick read offers advice that is comprehensive yet simple and often counterintuitive but always credible. Eat Move Sleep will help you make good decisions automatic -- in all three of these interconnected areas. With every bite you take, you will make better choices. You will move a lot more than you do today. And you will sleep better than you have in years. 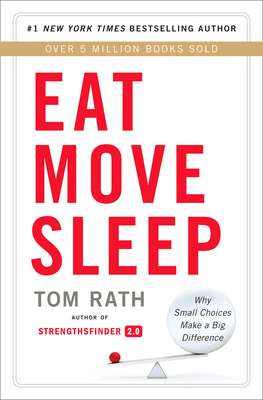 EAT MOVE SLEEP: How Small Choices Lead to Big Changes, the next book from #1 New York Times bestselling author Tom Rath, will be released on October 8th, 2013. To learn more about Tom Rath's books and current work, visit TomRath.org or follow @TomCRath. Extended Bio Tom Rath has been described by the media and business leaders as, "one of the greatest thinkers of his generation." He studies the role of human behavior in health, business, and economics. Tom writes and speaks on a range of topics, from wellbeing to organizational leadership. Tom's next book due out in October 2013, Eat Move Sleep: How Small Choices Lead to Big Changes, is already receiving critical acclaim as a "transformative work." Tom has written several international bestsellers including the #1 New York Times bestseller How Full Is Your Bucket? In 2012, his book StrengthsFinder 2.0 was the top-selling nonfiction book worldwide. Tom's most recent New York Times bestsellers are Strengths-Based Leadership and Wellbeing: The Five Essential Elements. In total, his books have sold more than 5 million copies, been translated in 16 languages, and made over 250 appearances on the Wall Street Journal's bestseller list. Tom is a Senior Scientist and Advisor to Gallup, where he previously spent 13 years leading the organization's work on employee engagement, strengths, and wellbeing. He also served as Vice Chairman of the VHL cancer research organization. Tom earned degrees from the University of Michigan and University of Pennsylvania, where he is now a guest lecturer. Tom and his wife, Ashley, and their two children live in Arlington, Virginia.